Manufacturers of armaments were the second category of industry to enter the motorcycle business, after bicycle builders. Birmingham Small Arms had a burgeoning factory, with plenty of experience metallurgy, pattern-making, casting, and machining, and set about making motorbikes in 1910. Their first V-twin appeared in 1920, a sidevalve sidecar tug, and they carried on making vees of different capacities, in side- and overhead-valve form, until WW2. BSA had a company philosophy of quiet reliability for their machines, and while they appeared in trials and the occasional race, it wasn’t until Wal Handley blasted a tuned Empire Star around Brooklands at over 100mph that a Beeza with sporting pretensions was announced – the Gold Star, so named for Wal’s prize for his efforts. 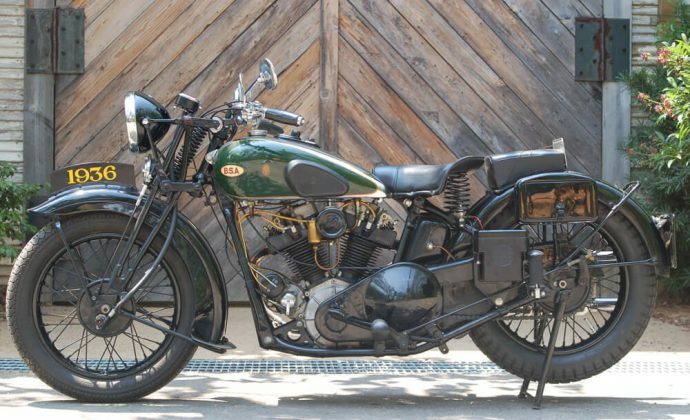 Yet BSA’s OHV V-twins were plenty sporting before the Goldie appeared, and the largest of their vees was the most sporty of all. At 750cc, the Y13 has plenty of power (26.5hp @ 4800rpm) and seriously good looks, which combined with their rarity (1600 produced in 3 years), means they’re about the most sought-after BSA of all. It has a stout full-cradle frame, and a 4-speed gearbox with footshift, and a full instrument panel on the tank top, and that wonderful twinned exhaust system, recalling far more expensive competitors. 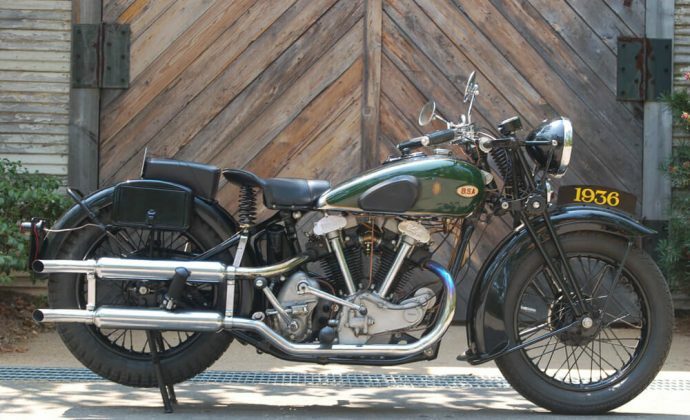 Every British V-twin built between the 1920s and 1950s commands a premium, and the OHV versions especially so, and it seems the prospects for the Y13 are only going to improve. This 1936 BSA Y13, engine # D 13 294, is a rare first-year model of BSA’s most desirable machine, and is in lovely restored condition.